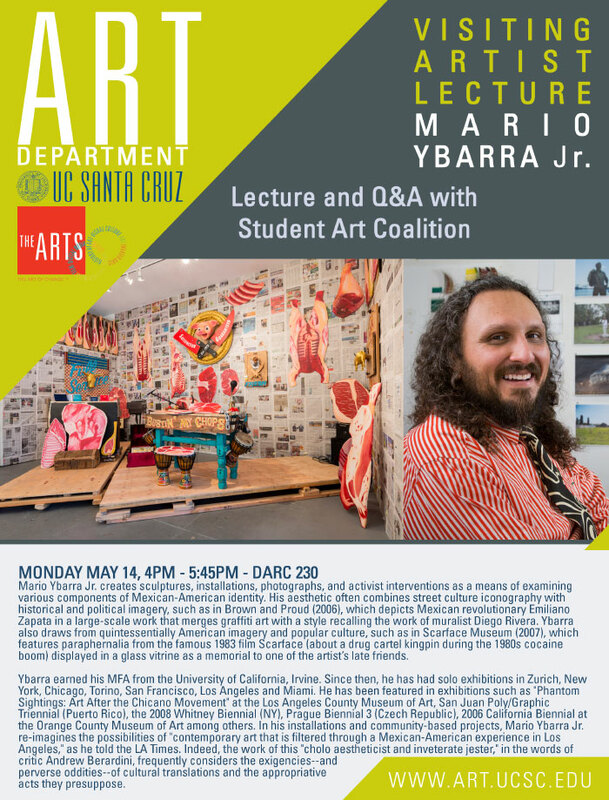 Mario Ybarra Jr. creates sculptures, installations, photographs, and activist interventions as a means of examining various components of Mexican-American identity. His aesthetic often combines street culture iconography with historical and political imagery, such as in Brown and Proud (2006), which depicts Mexican revolutionary Emiliano Zapata in a large-scale work that merges graffiti art with a style recalling the work of muralist Diego Rivera. Ybarra also draws from quintessentially American imagery and popular culture, such as in Scarface Museum (2007), which features paraphernalia from the famous 1983 film Scarface (about a drug cartel kingpin during the 1980s cocaine boom) displayed in a glass vitrine as a memorial to one of the artist’s late friends. Ybarra earned his MFA from the University of California, Irvine. Since then, he has had solo exhibitions in Zurich, New York, Chicago, Torino, San Francisco, Los Angeles and Miami. He has been featured in exhibitions such as "Phantom Sightings: Art After the Chicano Movement" at the Los Angeles County Museum of Art, San Juan Poly/Graphic Triennial (Puerto Rico), the 2008 Whitney Biennial (NY), Prague Biennial 3 (Czech Republic), 2006 California Biennial at the Orange County Museum of Art among others. In his installations and community-based projects, Mario Ybarra Jr. re-imagines the possibilities of "contemporary art that is filtered through a Mexican-American experience in Los Angeles," as he told the LA Times. Indeed, the work of this "cholo aestheticist and inveterate jester," in the words of critic Andrew Berardini, frequently considers the exigencies--and perverse oddities--of cultural translations and the appropriative acts they presuppose.